Photo above taken from here - A seriously inspiring link. I think we will have an orange wall sometime in the near future. Thanks so much for all the well wishes kind thoughts and words after my fall, the healing thus far is a changing process of ache zones and only some mild bruising, Left leg doing some funny things in the last 24 hours I assume from me relying more on it after my right side being injured. Your words of kindness lifted my mood considerably. Thanks Girls. You are so funny Tammy! So here I am, just home from a long weekend of farmers' markets in Melbourne, just wanting to kick back and look at some pretty pictures and this is what I find. Nope, they don't do it for me but I can appreciate them anyway. thank you for the link. this is totally the kind of clean pure mind clearing space i would love in my house. look at those seastar bunkbeds! Orange is in my top three colours. Love it. 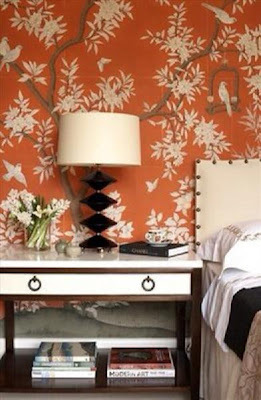 I am into orange at the moment too - mainly in accessories, not quite ready for an orange wall. I hope you are feeling better after your fall.